Gabe knows it was foolish to save that chicken. On the roof. In the middle of a storm. Yet Gabe also knows that his guardian, Ms Cleo, loves the chicken more than him. After falling off the roof, Gabe wakes up to find his neighbours staring at him tearfully. To his confusion, none of them seem to hear Gabe speak. It's almost as if they think he's dead. But Gabe's NOT dead. He feels fine! So why does everyone scream in terror when he shows up to his own funeral? Gabe flees with his dog, Ollie, the only creature who doesn't tremble at the sight of him. So when a mysterious girl named Wynne offers to let Gabe stay at her cozy house in a misty clearing, he gratefully accepts. Yet Wynne disappears from Bone Hollow for long stretches of time, and when a suspicious Gabe follows her, he makes a mind-blowing discovery. Wynne is Death and has been for thousands of years. Even more shocking ... she's convinced that Gabe is destined to replace her. 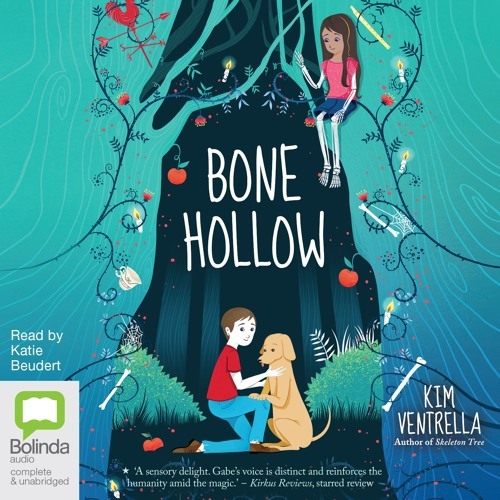 Can be purchased from Bolinda.com, Audible.com or borrowed from the library using our BorrowBox app.